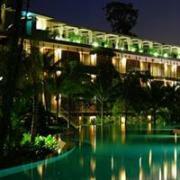 Check in to the Siloso Beach Resort Singapore from Sunday – Thursday and enjoy discounts. “Weekday Getaway” rates are SGD180 (USD143) for a Superior Room, SGD220 (USD173) for a Deluxe Room, or SGD320 (USD252) for a Family Room. Rates include buffet breakfast. A 10% service charge and 7% local taxes are additional. This promotion is available through December 30, 2012. This promotion is not available on weekends (Friday and Saturday), school holidays, eve & public holidays, or during major events & conventions. Superior and Deluxe rooms include breakfast for 2 people. Family rooms include breakfast for 4 people. Whether you’re looking for a fun family holiday or a romantic escape, the Siloso Beach Resort is a perfect choice. All rooms are fitted with modern amenities like air-conditioning and cable TV and overlook the South China Sea. 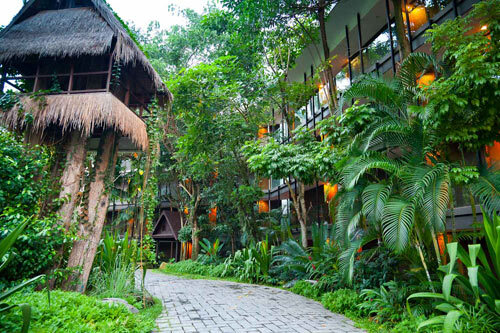 The resort is surrounded by lush foliage and its amenities include a restaurant, swimming pool, and easy access to all of Sentosa’s activities. Visit http://www.silosobeachresort.com for more information or to make an online booking. The Siloso Beach Resort can also be contacted by calling (65) 6722 3310/2 or emailing enquiry@silosobeachresort.com.